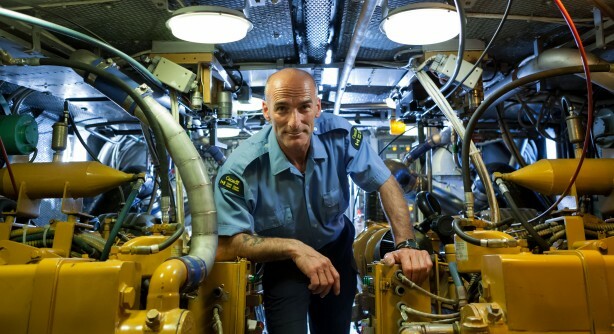 Charles Cormier has been a member of the Canadian Coast Guard for 28 years. Charles is a chief mechanic and a rescue specialist. He is a seasoned diver who has explored most of our planet's seas and oceans. His skills as a diver and studies in Naval Engineering have been in demand for many expeditions at sea. He has served on the Sedna IV, a ship that has undertaken numerous scientific expeditions and been used for the production of several oceanographic documentaries. Charles Cormier's discovery of a passion for undersea life was a bit of a happenstance. His first experience as a diver, such as it was, happened when he was seven years old. On a summer afternoon, Charles was at the beach with a cousin as babysitter. Taking advantage of a moment of distraction on her part, he borrowed her diving mask. With water up to his ankles, Charles poked his nose in a few inches of water and suddenly discovered a whole new world inhabited by crayfish and other small creatures. Explorer Jacques Cousteau became an idol. Today, Charles knows all the secrets of manta rays sharks, leatherback turtles and countless other denizens of the deep. His passions led him to search for shipwrecks. Charles Cormier's interest in ships, rescue at sea and diving made him drift naturally toward the search for shipwrecks. Estimates put at between 500 and 1,000 the number of wrecks of sunken ships in the vicinity of Les Îles de la Madeleine. Only a few of them have been identified. The others remain in oblivion, covered in sand at the bottom of the sea or crushed by icebergs. On his own, Charles has found, identified and documented through video about 15 wrecks which he would like to bring to public attention someday. The shipwreck to which he has now devoted his full attention is the loss of the CGS SIMCOE, a Canadian Government ship which was used in the 1910s to resupply the lighthouses of the Gulf of St. Lawrence. The ship was lost at sea on December 7, 1917, on its way back from resupplying the lighthouse of Rocher-aux-Oiseaux. To this day, nobody knows what happened to this great ship and its crew of 44. "SOS WE ARE SINKING A FEW MILES SOUTHWEST OF THE MAGDALEN ISLANDS IMPOSSIBLE TO GIVE EXACT LOCATION APPROX 10 MILES SO OF MAGDALEN ISLANDS LIFEBOATS IN WATER SEA IS ROUGH SOS"
Charles wants to study the wreck to understand what caused the ship to sink and, in a way, to pay a last homage to men who have all but been forgotten. At the time, the big news in the region was the largest explosion in naval history. The day before the sinking, two ships had collided at the entrance to the port of Halifax. One of the ships was loaded with a full cargo of ammunition. The explosion that ensued flattened the city and killed more than 1,800 people. His passion knows no limits. To locate the steel hull of the CGS SIMCOE, Charles Cormier acquired a magnetometer that can work in deep sea water. With this instrument, Charles has made a number of exciting finds: two British cannons dating back to the mid-1700s, 49 musket balls in a jute bag, part of a copper propeller and many other small treasures. The lighthouses: sentinels watching over mariners. Sadly, most of the lighthouses around Les Îles have been closed. Our rescuer at sea finds this appalling. "Even today, lighthouses are aids to navigation. There is nothing better than a fixed reference point on the horizon. When you see a lighthouse it is a confirmation that your instrument readings are true." Charles regards the lighthouses as witnesses to the maritime history of Les Îles and as part of the local heritage and culture. He finds it very sad that, one by one, the lighthouses are being ceded to private interests. His fervent hope is that the lighthouses will remain open to the public. The Anse-à-la-Cabane lighthouse is particularly close to his heart. Its first keeper, William Cormier, was his great grandfather.